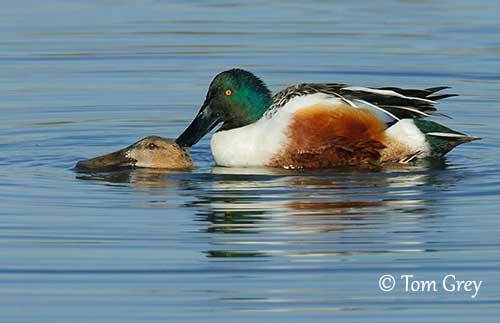 The Northern Shoveler is known for its large, spoon-shaped bill which has more than 100 lamellae along the cutting edges. The spatulate bill is used for straining food from water. This species breeds in temperate regions throughout the entire northern hemisphere where it frequents freshwater marshes and lakes with emergent vegetation, prairies and tundra near shallow water. It winters in N South America, Africa and S and SE Asia, in open lakes, estuaries and coastal lagoons. 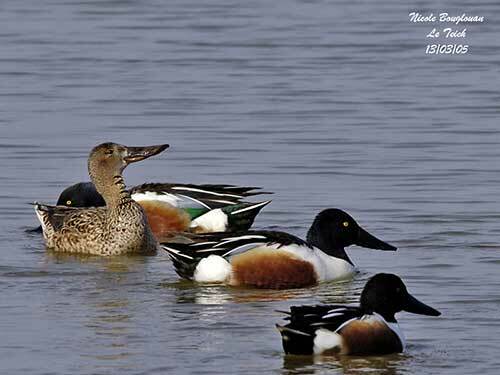 The Northern Shoveler is widespread and locally abundant throughout its wide range, and the species is not currently globally threatened. This species was described first in 1758 by Carolus Linnaeus, a Swedish botanist, physician and zoologist. 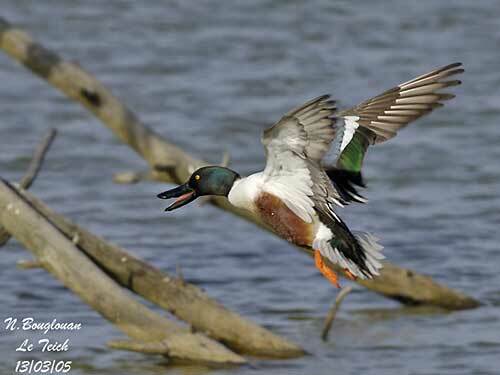 The Northern Shoveler adult male in breeding plumage has dark green head and neck, black back with broad, white braces well visible in flight. On the upperwing, we can see a grey-blue shoulder patch on wing-coverts, separated from a bright green speculum by a tapered white stripe. The primaries are brown. Central rump and uppertail are blackish with white outer rectrices. On the underparts, the breast is white, whereas belly and body sides are bright chestnut. The underwing-coverts are whitish and the flight feathers are dark. Vent and undertail-coverts are blackish. It goes into eclipse plumage in late summer after moulting. It becomes mottled brown, but it differs from the female by a white streak in front of the eye. Flanks and belly are more rufous and the head is darker. In early autumn, it has a sub-eclipse plumage, a “mix” of breeding and eclipse plumages. The female in breeding plumage has mottled brown plumage, black and white feathers above and blue wing patch. In non-breeding plumage, she is darker but less than the male in eclipse. 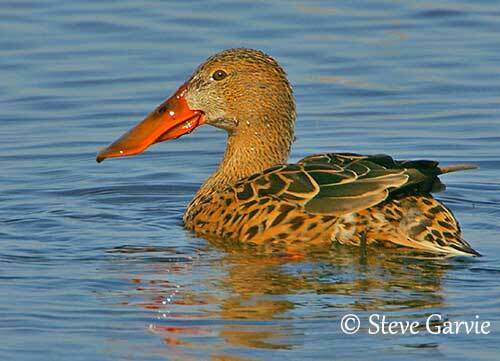 The male has black bill, pale yellow to orange eyes, and red-orange legs and webbed feet. The bill becomes brownish in eclipse. The female has browner bill with yellow cutting edges, dark brown eyes and orange legs and feet. The juvenile resembles non-breeding female, with darker, more uniform upperparts and duller upperwing, while the underparts are more streaked. In young male, the wing pattern is brighter. The young female has grey-brown wing-coverts, and the green speculum is sometimes absent. 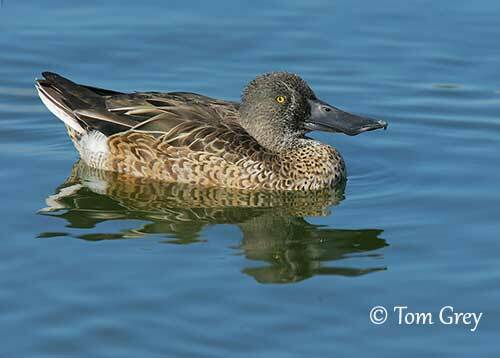 The Northern Shoveler breeds in most of Nearctic and Palearctic, except in High Arctic regions. It winters S to N South America, Africa, S and SE Asia, usually north of tropical zones. In North America, it breeds from W Alaska to California and Great Lakes region. It is uncommon in E North America. It winters S from British Columbia and N Carolina to Central America, to Panama and N Colombia, and also Hawaii. In the Old World, it avoids arctic regions, but it breeds in Iceland, and locally SW and S Europe. It breeds mainly from British Islands, through C Europe and C Asia to Kamchatka, S to Mongolia. It winters in Africa and Asia (north of tropical zone), and in W and S Europe and E Asia. Through Nile Valley, it reaches E Africa and N Tanzania. 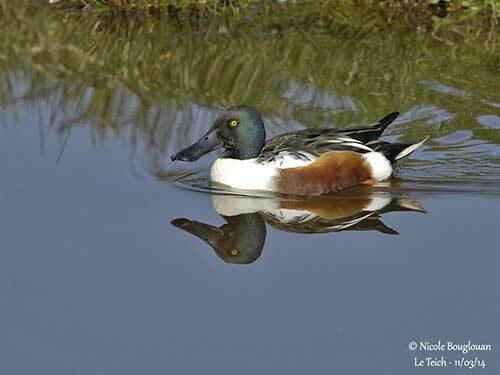 The Northern Shoveler breeds in freshwater marshes, ponds and lakes with emergent and fringing vegetation and muddy margins. It occurs in prairies and tundra, usually close to shallow water. On migration and during winter, it can be seen on open lakes, fresh marshes, estuaries and coastal lagoons, shallow waters with muddy margins and even stagnant and polluted waters, neglected by other duck species. This species has been recorded to 4000 metres of elevation in Ethiopia in winter, and to 2800 metres on passage in Bhutan. 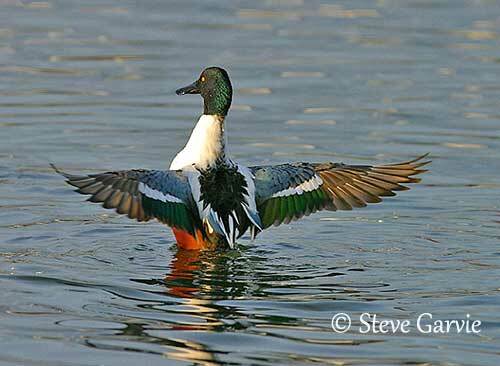 The Northern Shoveler is rather silent, but during the displays, the males produce a repeated, hollow “sluk-uk” also given in flight. 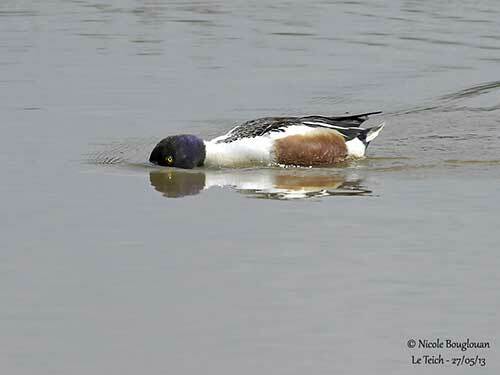 The Northern Shoveler’s diet often varies, depending on the season. It feeds mainly on plant material in winter, such as seeds, parts of aquatic plants (sedges, pondweeds and grasses). During summer, it feeds mostly on aquatic invertebrates including insects and their larvae, crustaceans, molluscs and occasionally small fish. It feeds by swimming slowly with the bill skimming the water surface, or with partially submerged head. The bill often sweeps from side to side to reach the food filtered by the lamellae. They often feed in groups and swim in rotating circles to stir up the water and bring food to the surface. It may dive in shallow water, and also performs head-dipping and sometimes upending. 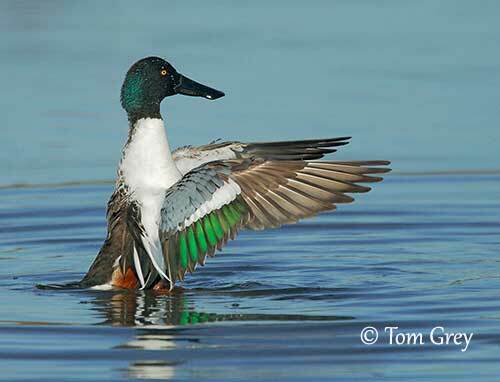 The Northern Shoveler starts displaying in winter, and continues during the return migration. Typically, several males court one female by swimming around her on water. Each male tries to lead her away by swimming away or by short flight. If the female is interested, she flies away with the chosen male. Copulation takes place in the water. The pairs form from mid-winter to spring (sometimes to May). They are generally monogamous, probably for a single season. 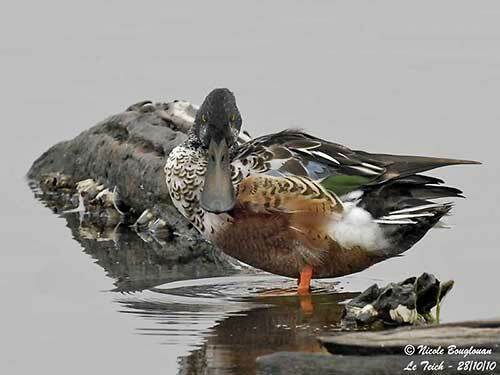 The male may remain with the female longer than males of other duck species, and often guards her during the incubation. Extra-pair copulations are rare, and polyandry has not been confirmed in recent studies. 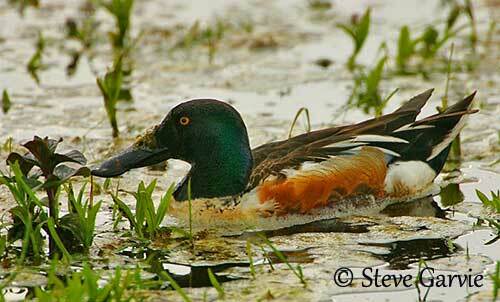 The Northern Shoveler is migratory. In W Palearctic, the breeders leave the breeding grounds in late October and depart tropical Africa in February, with peak N movement through Europe in mid-March to mid-April. They migrate in flocks. 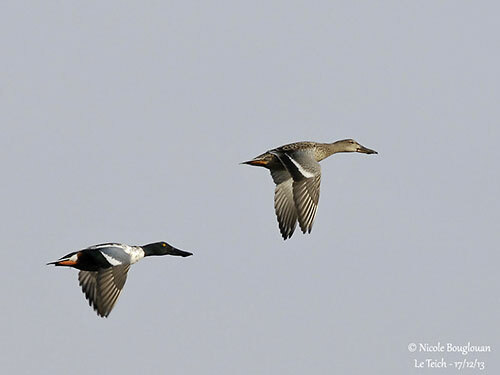 The Northern Shoveler is a good flier with strong, direct flight and powerful, rapid wingbeats. The breeding season starts in April/May. 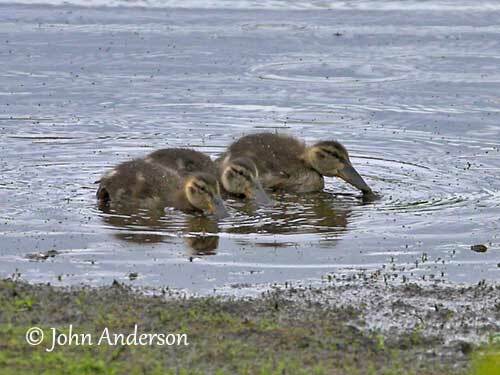 The Northern Shoveler nests in single pairs or loose groups. The female selects the nest-site, usually in short grass. She builds a shallow depression with grass and weeds, lined with down, usually close to water. The female lays 9-12 pale olive eggs and incubates alone during 21-27 days, sometimes guarded by the male. At hatching, the chicks have dark olive-brown down above and buffish below. They have a dark eye stripe and a large dark ear spot. They leave the nest a few hours after hatching, and follow the female to the water, but close to the vegetal cover. They fledge between 36 and 45 days after hatching (52-66 days in Manitoba). They are tended by the female alone. The Northern Shoveler is relatively widespread and locally abundant, but it is threatened by habitat loss in Britain and Ireland, predation by Neovison vison, and lead shot ingestion in France and Spain. It is hunted in North America and Iran. The global population was estimated to number 5,500,000/6,000,000 individuals in 2006. 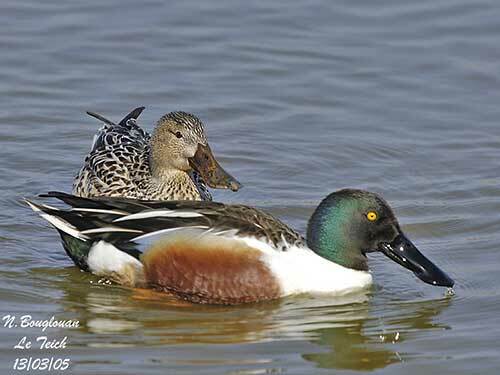 This population is slowly decreasing, but currently, the Northern Shoveler is evaluated as least Concern.